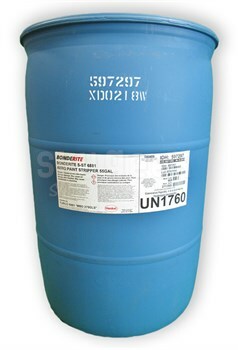 Henkel BONDERITE S-ST 6881 AERO ( Formerly Turco 6881) is a low odor, thixotropic paint remover activated by hydrogen peroxide. It was developed for effective stripping of such resistant finishes as epoxies, epoxy primers, polyurethanes, and similar catalyzed aircraft paints. Henkel BONDERITE S-ST 6881 AERO paint remover offers a significant advance in paint stripper technology. It complies fully with the aircraft/aerospace NESHAP. TURCO 6881 can be used on aluminum, mild steel, high strength steel, and titanium when used as directed. TURCO 6881 is not recommended for use on magnesium.